Draft: 8 ft., 6 in. Beam: 13 ft., 5 in. The Back Story: Rose of Sharon broke into the world as a creation of designer W. Starling Burgess and builder Eastern Shipbuilding of Shelbourne, Nova Scotia, Canada. She was built in 1930 and constructed for J.P. Morgan Co. President Thomas J. Lamont. He owned Rose of Sharon until 1935, when he sold the Burgess-designed vessel to Fred Pape. What’s in a Name: Pape owned the vessel until 1940 and raced her as San Cristobal II. The schooner was renamed Rose of Sharon in 1940, thanks to the vessel’s third owner, Charles Stoll of Escanaba, Michigan. She continues to bear her original name 76 years later. “Rose of Sharon was designed by Burgess as Ninette, a smaller version of Nina, which was 59 feet on deck and 50 feet on the waterline,” said Byron Chamberlain, the schooner’s current owner. From Generation to Generation: Chamberlain is Rose of Sharon’s fifth owner. Ahead of him were Lamont (1930-1935), Pape (1935-1940), Stoll (1940-1970) and the ship’s carpenter, Roy Wildman (1970-1973). Blasts from the Past: Rose of Sharon was quite active on the racing circuit. Her first competition was the 1930 Bermuda race, in which she placed second. Stoll raced Rose of Sharon in several competitions during his 30 years as the vessel’s owner, putting the schooner up in the Chicago Yacht Club’s Race to Mackinac, for example. Her first race with Wildman was a huge success; Rose of Sharon finished first in the New York Yacht Club’s Mayor’s Race. Wildman sold Rose of Sharon to Chamberlain on Dec. 7, 1976. Chamberlain celebrated the schooner’s 50th birthday by claiming first overall in the 1980 Newport to Ensenada race. Rose of Sharon went on to finish the Ancient Mariner Race (from San Diego to Maui) in 13 days and five hours (a record time) and placed second in class in the 1983 Victoria B.C. Swiftsure Race. In 2009 Rose of Sharon claimed second place in the Marina del Rey to Puerto Vallarta Mexico race. 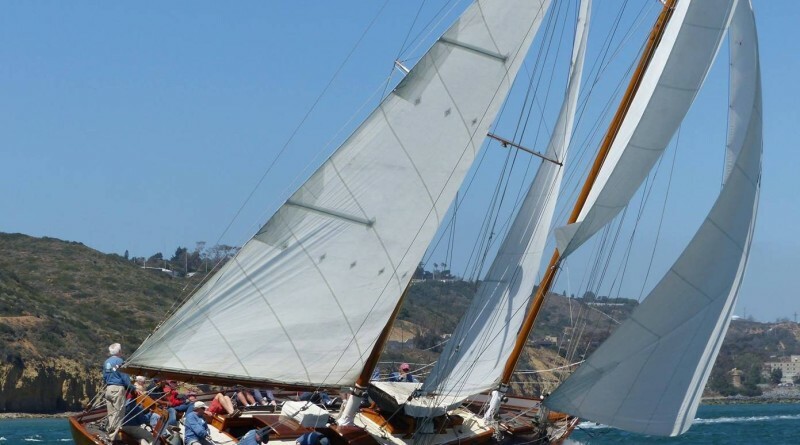 She also performed well at Ancient Mariner and Schooner races during her lifetime. Home Base: Newport Harbor Yacht Club, Newport Beach, California.